Keeping up to date with software installers such as Softaculous and Fantastico can bring new features to your website and remove any bugs found in previous version releases. It is important that you considering taking a backup of your website before proceeding with any software updates. No liability is accepted should an update that you make effect parts of your website. 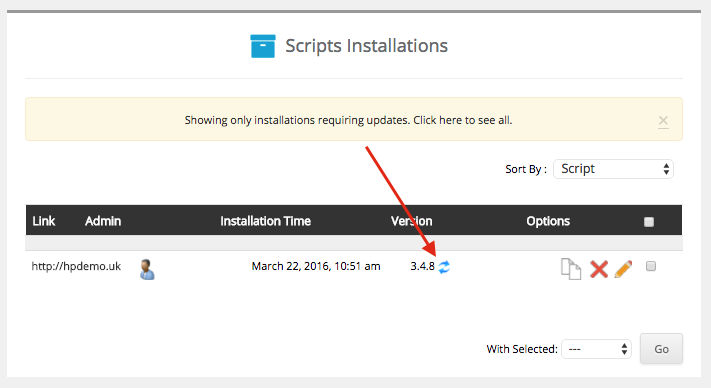 The following instructions shows a WordPress update using Softaculous. Scroll down to the 'Softaculous Apps Installer' section. If there are any updates available, you should see a prompt available letting you know this. Click onto the notice to start the update process. Under the 'Version' heading, click the two circular arrows. 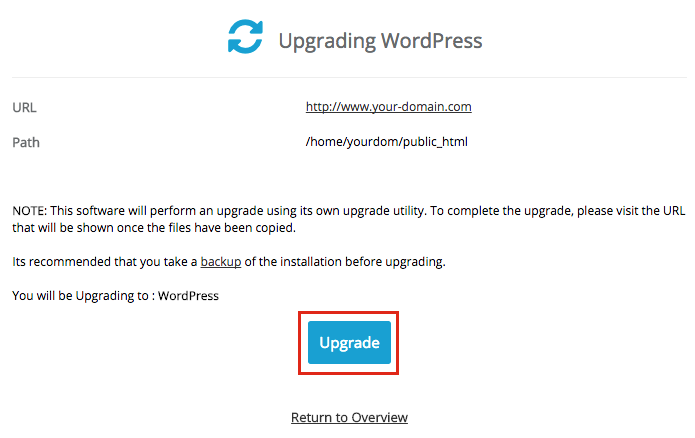 Select the 'Upgrade' button to complete the software upgrade. Depending on the script software that you are updating, additional instructions may be required after this step. For example, with Wordpress, database changes may be necessary but this will be prompted to you on screen to complete. If you're looking to upgrade to the latest version but can't see this version in Softaculous, it may be because upgrades are slightly delayed as we have to wait for the software makers to integrate the new versions. As soon as they do that this will become available for upgrading. If you want to keep up to date with the immediate latest versions, then you'd have to manually install the software and keep up to date with the upgrades manually thereafter. Upgrade software using Softaculous is now complete.